. : 2005 Keskinada Preview :: Ski XCOttawa.ca :: Skiing in Ottawa and Gatineau Park :. This weekend Gatineau, (near Ottawa) will host Canada’s only Worldloppet stop, the Keskinada. The excitement is starting to build and some of the top skiers have already arrived to go through their final preparations. Given the history of the weather the last few years, as well as the current forecast, this will most certainly involve stitching up any holes in their windbriefs. Indeed some people no doubt wonder if the word Keskinada actually is “frozen private parts” in some obscure language. One of the forecasts I saw recently predicts an overnight low of –29°C before the race. Ouch! The “Big Race” of the weekend is undoubtedly the 50skate on Sunday. Unfortunately, the “Keski” is not part of the FIS Marathon Cup this year, and was not last year either. Organizers cite a lack of funding. On the other hand, the prize money is good enough to have attracted a few big guns, so the race promises to be exciting nonetheless. In the women’s event the local favourite is Sheila Kealey, who was narrowly beaten by Tara Whitten of the Canadian National Team in the Keskinada last year. Sheila has been consistently among the top finishers the last few years and the Ottawa crowd would love to see her on the top step of the podium. Being a 40 year old mother with a full time job, a victory would provide inspiration to many. Sheila will likely have her hands full against Tasha Betcherman and Brooke Gosling, both of Canmore, and both very familiar faces in the Great White North. Back to defend his title in the men’s race is the well-known Stanislav Rezac of the Czech Republic. Last year he went straight from his plane to the sprint event, woke up the next day and won the 52km classic event by a good ten minutes, and then squeezed out a victory in the signature event of the weekend, the 50k skate. The next weekend he placed second at the American Birkebeiner. Pretty tough guy I guess. He can expect to be challenged, at least in the skate event, by, among others, Ivan Babikov of the Subaru Factory Team who continues to win race after race of any distance or format all over North America. Other names to watch for include, but are not limited to, Steve Cyr, Chris Blanchard (former Canadian National Team members in x-country and biathlon), Cyrus Kangarloo of X-C.com, and XC Ottawa’s own Craig Storey and Wayne Dustin. A dark horse contender is Will Fitzgerald, originally from Newfoundland, and just back from Europe where he participated in the Marcialonga and both days of the Konig Ludwig Lauf in Germany. Will was Canadian champion in the 15 skate in 2003, and placed second at the Keskinada in 2002. Rumour has it he just came back from a special training camp at 2500m elevation in Armenia and is thus very well prepared. 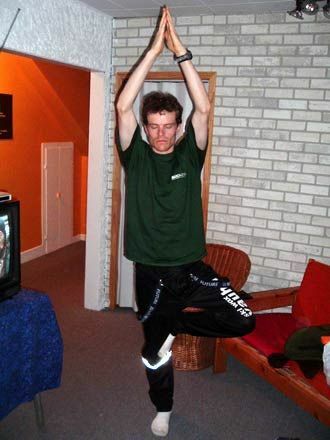 In addition, Will says that since discovering Yoga, he has noted considerable improvement in his performances. Stay tuned to find out how it all unfolds.